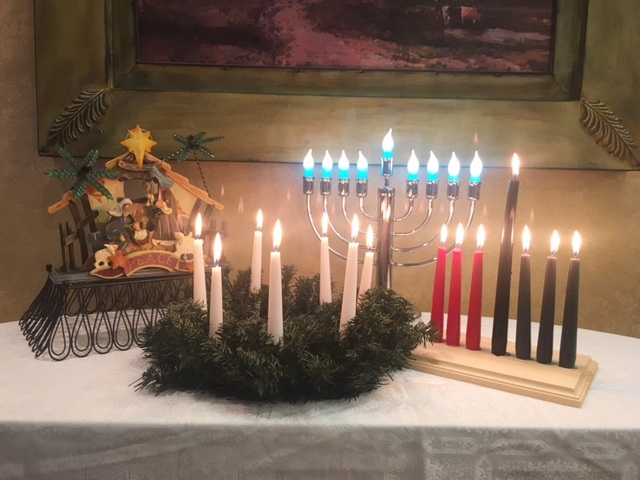 Of all the months of the year, December is the one where we all remember and celebrate miracles: the miracle of light in a Jewish synagogue, the miracle of birth in Bethlehem, the miracle of fire that would not burn a saint (Lucia), the miracle of cycles and seasons in the Winter solstice, and renewal and remembrance in Kwanzaa. That is part of what makes this month and this season so special – the rituals of remembrance and renewal that have become traditions. In between these two traditions our residents are offered a variety of activities designed to encourage friendships and family. Some are planned and some will be spontaneous (like our Holiday Lights Tours), but we all will find that there is more than one way to celebrate the season. This month, of all the months, we look to our miracle(s) to remind us of our humanity, our connection to others both past and present. Sacred or secular really doesn’t matter as long as we stop and reflect on our own miracles and find renewal in our friends and families. So, from the staff and residents at Gates Mills Club, our wish for you is to have yourself a merry little… Hanukkah / Christmas / St. Lucia / Solstice / Kwanzaa / Whatever! And, in 2016… we wish you the best New Year ever! ← We Salute our Resident Veterans!